HOUSTON — So much to do, so much to say, so much to cover. Starting with this: Roger Goodell will spend the 10th anniversary of being named commissioner (he got the gig in Northbrook, Ill., on Aug. 8, 2006) clunking heads together in Canton and New York today over the cancellation of the Hall of Fame Game on Sunday night. The cause: poor artificial turf conditions. The upshot: a serious re-examination whether the game should be played, and if it should, where. The MMQB’s Jenny Vrentas was in Canton, and I asked her to give us a short summary of what happened and why. We’ll get to that in a few moments. But first: It’s probably smart to play the Pro Football Hall of Fame Game—if you’re going to play it at all—54 miles north in Cleveland, on a pristine field, rather than on a glorified high school field at the Hall of Fame in Canton. It’s actually used for high school games, mostly, the rest of the year. There’s just too much at stake, even with a first preseason game with regulars barely seeing the field, to play the game on a risky surface. Suffice it to say the debacle of Sunday night simply cannot happen. It’s an embarrassment of the highest order. Cancelling a nationally televised game, with ESPN marking the occasion with its new pregame team and new crew in the booth, is a ringing exclamation point to those who like to pile on Goodell for his failings in office. It’s a coincidence that it comes as Goodell and the league mark the milestone. (Or don’t mark; in a league that celebrates every anniversary and birthday with PR fireworks, not a peep about Goodell’s 10-year anniversary.) Or millstone. Not sure which it is. • Carolina, where Ron Rivera continues to stand by his man. 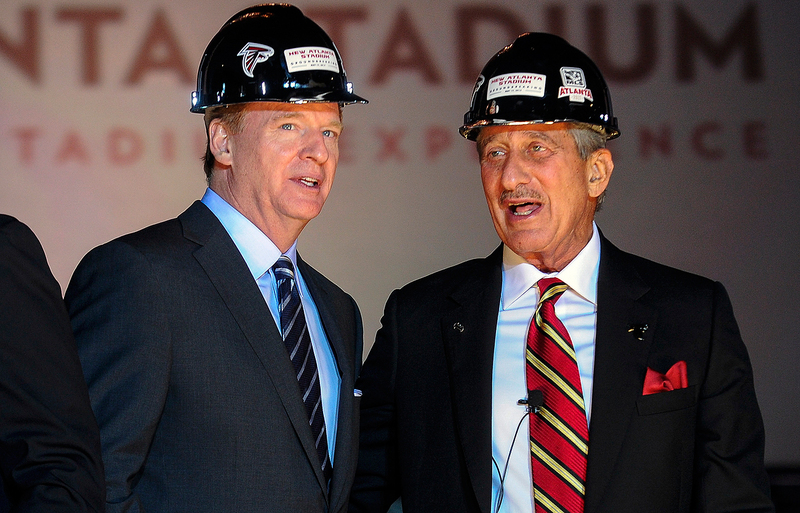 • Atlanta, where owner Arthur Blank is standing by his boss too. • Tampa Bay, where patience is not a virtue. • Jacksonville, where Myles Jack has a very strong message for the NFL, and for the college players who come behind him. • Houston, where one of the best players of the last 15 years had a surprise birthday party last night. In training camp. And there’s the Hall of Fame speeches (nice job, Favre and DeBartolo and Dungy) … the return of Monte Kiffin … the return of “Hard Knocks,” with Jeff Fisher whacking someone in episode one … and the Nickname That Shall Not Be Named isn’t going anywhere. On with the show. Cam Newton and Ron Rivera are starting from scratch after a disappointing end to an otherwise electric 2015 season. SPARTANBURG, S.C. — Early in the off-season, Ron Rivera was in need of some advice handling people. One person in particular. He emailed the noted former U.S. Navy admiral, William McRaven, now the chancellor of the University of Texas, and asked another very bright leader of men if he’d handled Cam Newton’s post-Super Bowl press conference mopefest the right way. You may recall that Rivera found no fault with Newton the player or postgame speaker, and even said the NFL shouldn’t subject Super Bowl-losing players to interviews the night of the game. “Did I enable him?” Rivera asked McRaven. No, McRaven said. The retired admiral is a believer in praising in public and criticizing in private, and he thought Rivera did the right thing by standing by his most important player. Backing Newton, McRaven felt, would show Newton his coach cared about him, and provide a good example to learn from. Essentially, the admiral felt that even in a transcendent year for the NFL MVP, a humbling game and postgame aren’t the worst things in the world to experience, because sports mirrors life. Sometime you fail. Deal with it. Here we are, six months after the only bad day of the Panthers’ 2015 season, and Rivera still feels strongly about the events that followed the Super Bowl loss to Denver. He still thinks losing players should talk the day after the game, rather than 20 to 30 minutes after the game, and he thinks the losing coach is the one who should stand up after the game as spokesman for the team. “We want our football players to lay it on the line, to give everything in the biggest game of their lives, and then we want them a few minutes after the game to be all normal and eloquent about it? People want our guys to be gentlemen right after the biggest loss of their lives. Hey, I want my guys to be crushed. That’s not going to happen, players from losing teams cocooned until the next day. I understand Rivera’s frustration, and it does often seem cold to me for a losing player after the Super Bowl to walk off the field and into the media interview area. Often they haven’t been spoken to by coaches yet. The league could bring winners in first, followed by players from losing teams. But the demand is too great and the game too big. The NFL MVP loses the Super Bowl, and he can’t walk into the sunset for 15 hours. 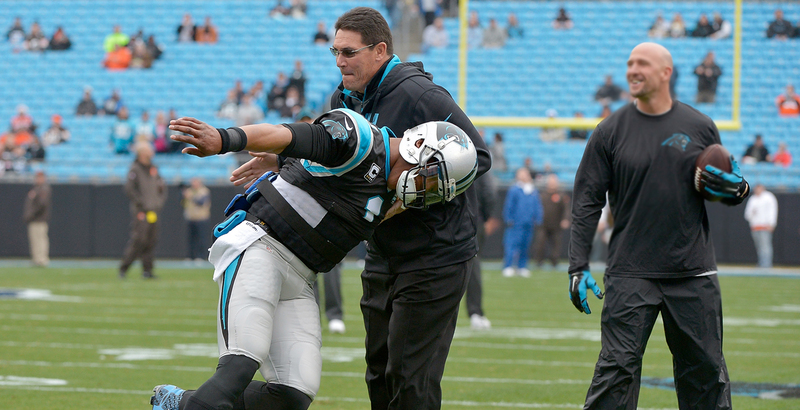 Rivera talked to others this off-season, seeking advice. One adviser: Tony LaRussa, who told him to forget last season and build his team all over again in 2016. That’s been one of Rivera’s themes with his team. Put in the work, start from scratch, and the reward—for all 53 players, including Newton—can be bigger in 2016. Field maintenance workers scrambled to get the turf ready for Sunday night’s game, which ultimately was cancelled due to unsafe playing conditions. CANTON, Ohio — The weekend that is supposed to be a celebration of football turned extremely embarrassing for the Pro Football Hall of Fame and the NFL on Sunday night. About an hour before the Hall of Fame Game between the Colts and Packers was supposed to kick off, teams were notified the preseason contest would be canceled because of unacceptable field conditions. Thousands of fans sat in their seats, waiting through replays of the previous night’s Hall of Fame speeches, until an official announcement finally came at 8:01 p.m. The issue was a botched paint job on the field turf. The turf at Tom Benson Stadium in Canton has been criticized in the past, with former Steelers kicker Shaun Suisham suffering what would be a career-ending ACL injury in last year’s Hall of Fame game. Suisham led the charge this offseason on this issue, which helped result in the creation of a joint committee between the NFL and NFLPA to monitor field conditions, including at non-traditional venues like Canton. But the turf at the stadium last night was new, installed earlier this this summer with the surface used in the Superdome for the 2016 Sugar Bowl. About 20,000 fans sat on top of the playing surface during last night’s enshrinement ceremony. 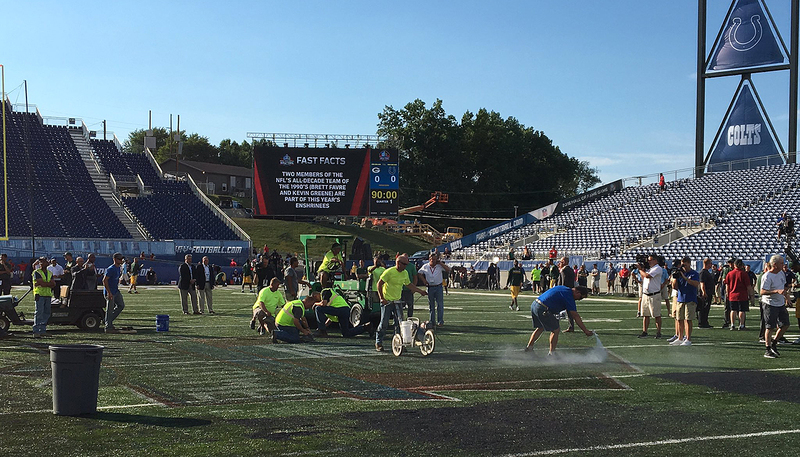 The cover on the field didn’t come off until Sunday morning, and the issue arose when areas of the turf were painted, including the Hall of Fame logo at midfield. Things looked bad less than two hours before kickoff when both teams’ head coaches, general managers, owners and medical staffs were conferencing at midfield. Looking up close, there were clumps where red, white and blue paint had congealed with the turf pellets, creating patches that were both slick and rock-hard, an obvious safety concern. Workers were spraying around the logo and driving vehicles with what looked like street-cleaning brushes back and forth, in an apparent attempt to break up these clumps. Later, they were shoveling up piles of loose turf pellets into trash cans. It was an ugly scene. There are plenty of players and coaches who would like to see the game scrapped. That probably won’t happen, but you can bet they’ll talk about switching venues. NFL commissioner Roger Goodell has been a punching bag for the public but still has the support of owners like the Falcons’ Arthur Blank. Today being the 10-year anniversary of the day Blank and the league’s other 31 owners voted for Roger Goodell to succeed Paul Tagliabue, I thought I’d ask one of the men most responsible for Goodell’s power and influence and salary how he’s doing. I saw Blank last week, and so obviously his comments were made before the Hall of Fame debacle Sunday night. Before I sat down with Blank, I got a tour of his office, filled with photos nostalgic and current with people from around the league. There’s a note from Goodell, from 2011. It ends with: “I will work tirelessly to make you proud of me.” The relationship between the two men, clearly, is more than commissioner/owner. If the current climate, in which Goodell is probably the most disliked man in American sports, is wearing on Blank and concerning to him, he doesn’t voice it. The Compensation Committee approved paying Goodell $111 million in salary and benefits from 2013 to 2015, and I get no indication from owners when I speak to them about a rumbling for change. It’s just hard to imaging Goodell lasting another 10 years if public opinion doesn’t take a turn for the better. Dirk Koetter was an offensive coordinator for three teams, dating back to 2007, before getting his first chance as a head coach. TAMPA — One thing I admire about Bucs GM Jason Licht: He doesn’t shy away from the tough questions or the tough issues, and what they mean to his franchise and his own future. Such as this one: When is Tampa Bay going to pick a coach and stick with him through tough times? I spy a trend. Dungy and Gruden got long tenures, relatively speaking. Morris, Schiano and Smith averaged 2.3 years of a chance. On my camp trip, when I’ve asked coaches and executives (three so far) about the impatience of teams with head coaches, every one named Tampa Bay as a problem franchise, particularly after Smith was whacked last January despite having a rock-solid relationship with his defense and the strident support of Jameis Winston, his franchise quarterback. So, I asked Licht: How important is it for you for this latest choice, former offensive coordinator Dirk Koetter, to be correct? Very few coaches ever do that, of course. None in the past 30 years in this town. The beloved Dungy, a saint in this area, the new Hall-of-Famer, was bitterly disappointed to get fired after a 2001 playoff run. He left Gruden a Super Bowl team. Gruden won one, then got whacked himself six years later. And of course, you don’t know what’s more important in the early head-coaching career of a head man, security or success. But I’d advise Koetter to hold off on building his retirement home on the gulf shore. Those who know Koetter say he prides himself on being a teacher. 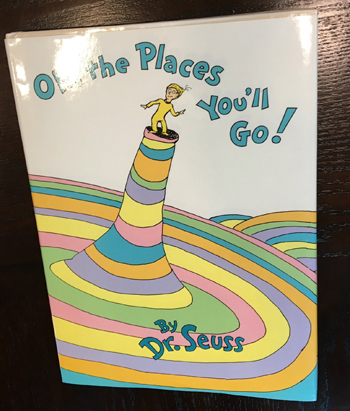 It felt strange to be in a coach’s office, as The MMQB team was on Saturday, and gather around a coffee table, and look down to see “Oh, The Places You’ll Go,” by Dr. Seuss. Reading material in the office of Bucs coach Dirk Koetter. 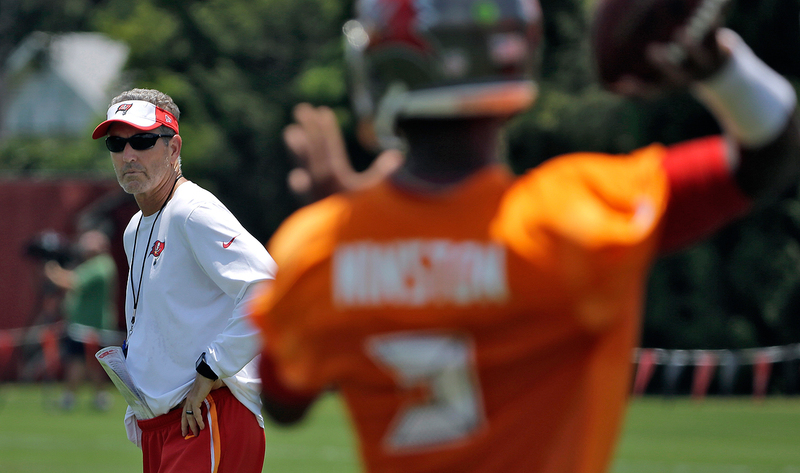 “Every message that a coach gives his team is in that book,” Koetter said. Oh, the places you go! There is fun to be done! Koetter won’t make this game harder than it is. That’s probably a good approach, especially to young players who probably aren’t going to be moved by Lombardi’s words. But however he approaches it, there’s a bottom-line mentality here, for better or worse, and he’d better hurry. 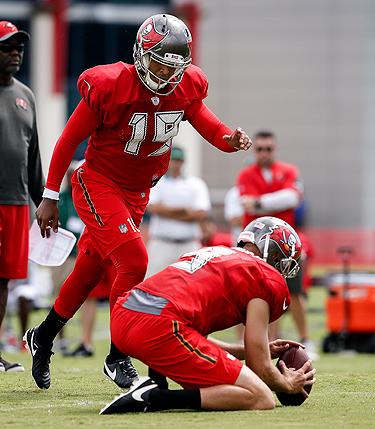 Rookie kicker Roberto Aguayo of the Buccaneers. Oh, there will be some pressure on him. Tampa Bay GM Jason Licht dealt a fourth-round pick to move up 15 spots to obtain the late-second-round pick he used on Aguayo. ​MMQB: Do you feel the pressure, being a second-round pick? Obviously, most teams don’t take kickers that high. MMQB: Strange to think something can be easier in the NFL than in college football, but the hashmarks are narrower in the pros. You were either perfect or close in college when kicking from what would be the NFL’s hashmarks. Is it a big deal to you? Aguayo: It’s a big difference. In the NFL, they’re basically in line with the uprights, and you don’t have those wide angles you’ve got in college when you’re out on the outside hashes. So it’s a different kind of mind game in the NFL. MMQB: You played soccer, and you’re a fan. What did you think when Messi missed that penalty kick in the Copa America final? Aguayo: I saw that. That’s sports. You know, say if I were to miss a kick at the end of the season, it’s just, I mean that’s what the sport is, why we enjoy it, because you never know. That night, everybody thought, Oh, Messi’s going up to take a penalty. He’s gonna make it, guaranteed. MMQB: That’s what they’re going to think about you. How do you feel about that? Aguayo: It’s just the way of the game. It’s that pressure, man. Sometimes at the end of the game, it’s just me, and I need to win, I need to do it. Only a few people in the world get to do that, so it’s fun at the end of the day. Myles Jack hasn’t had any issues at camp with the knee that caused him to drop out of the draft’s first round in April. JACKSONVILLE — There was something heartening about seeing number 44 in white turning and sprinting to chase a play Friday night in a Jaguars scrimmage at Everbank Field, or making the defensive play call and lining up his mates. Myles Jack was playing full-speed football again. Jack’s the former UCLA linebacker, still only 21, who sat much of his last college season after knee surgery, whose stock fell from top-five prospect to pick 36 in the 2016 draft. Now he’s tried to put that behind him. (He hasn’t.) And he wants his story to be a cautionary tale for future Myles Jacks. “Please put this in all caps,” Jack told me Friday. Two days before the draft, Jack told Bart Hubbuch of the New York Post that “down the line, possibly, potentially,” he could have microfracture knee surgery. Microfracture is a riskier surgery than ACL surgery and involves creating small cracks in the bones of the knee to spur cartilage growth. Even mentioning it would scare an NFL team. Teams were already cautious about Jack, coming off surgery. The microfracture addition made it worse. Jack is settling in Jacksonville, where it’s all football on a very young team. He seems happy enough, and he ran around Friday night with verve, still in the process of getting to know his new mates. But he won’t forget the mega-draft-drop. HOUSTON — I landed at the Houston airport late Saturday afternoon and got in a rental car. The temperature gauge on the dashboard was 99. It was 100 on Sunday. Forecast highs for the week, beginning today: 99, 99, 99, 100, 100. Heat index (combining heat and humidity) on the field Sunday for the 9 a.m. practice: 120. The one constant at camp for the Texans? Oppressive heat. 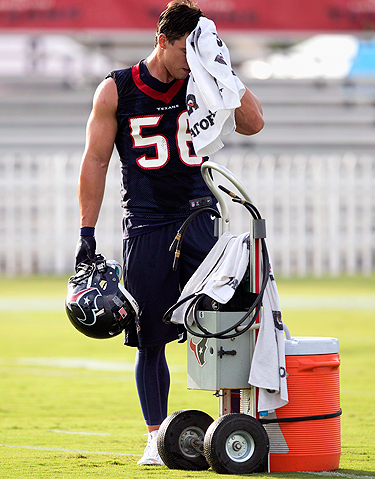 The Texans have equipment guys lugging those eight-packs of small bottles of Gatorade, not just squirts of water; Sunday, some players just grabbed a bottle on the sideline, wrestled it from its plastic coupling and inhaled it. It’s just incredible to stand out in such heat for two-plus hours and imagine players who have to try to make a football team in the oppressive conditions. • Sunday was punter Shane Lechler’s 40th birthday. On Sunday night, O’Brien and players Vince Wilfork, Brian Cushing and Johnathan Joseph called Lechler to the front of the team auditorium, gave him a cake shaped like the number 40, and also got him a walker, some Rogaine, and those Steph Curry sneakers people think look old-fashioned. Then the teams sang him Happy Birthday. He’s coming off a season in which he avearged 47.3 yard per punt, fifth in the league, and no one here is trying to nudge him into retirement. In 16 seasons, the 47.3-yard average is better than any of his first six NFL seasons, and just two-tenths of a yard off his career average. Here’s how long he’s been around: Lechler’s had beers with Ken Stabler. “I’m not in any mood to start growing up,” he said. 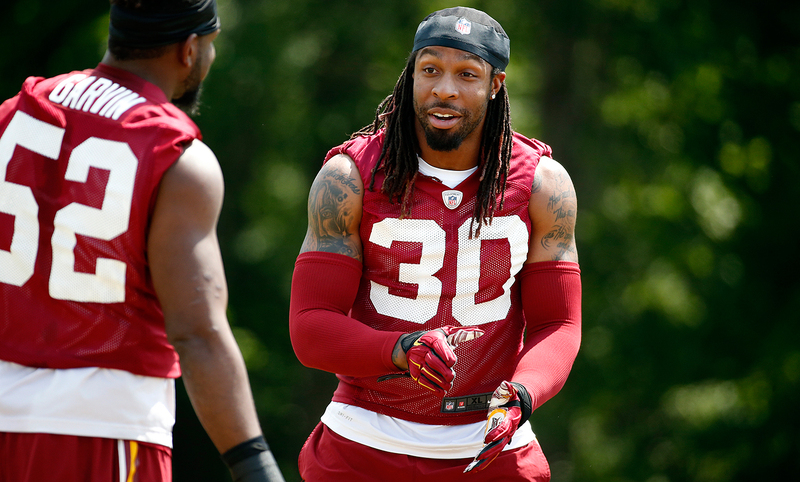 Former Broncos safety David Bruton has found a new home in the Washington secondary. Baltimore: Benjamin Watson, tight end. Watched him in one practice. So who knows what it all means. But watching that one practice, last Monday night in the Ravens stadium, made me think I’d draft Watson as a tight end if I were trying to win a fantasy league. I mean, not as the best tight end, but as a top-five tight end. Healthy, he’ll catch 70 balls. Washington: David Bruton Jr., safety/special teams. After a valuable run in Denver that culminated with a key role on the Broncos’ Super Bowl special teams, Bruton and his mountain bike (he’s as avid a biker as there is in the NFL) are in Richmond for training camp, trying to help Ben Kotwica’s kicking game. Really good signing. Bruton’s a great chemistry guy and valuable player. Atlanta: Matt Simms, quarterback. I must say I’ve never seen four consecutive Matts on any roster in NFL history. (And really, isn’t that what we all look for?) Here we go, by jersey number: 2. 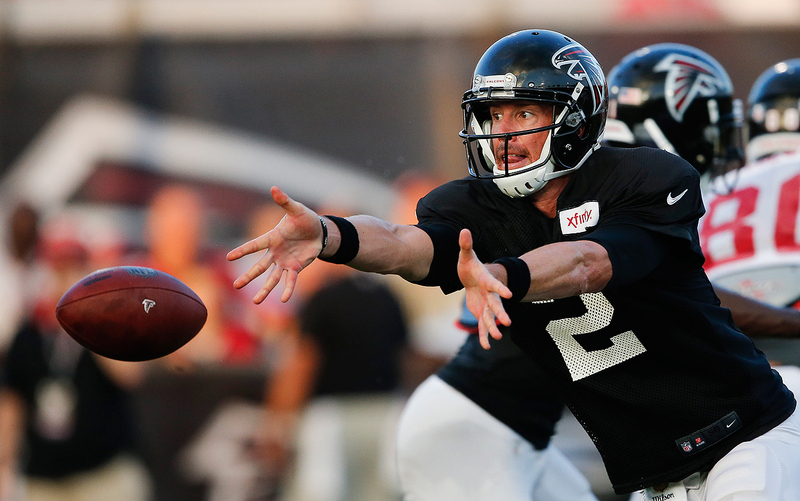 Matt Ryan, QB; 3. Matt Bryant, kicker; 4. Matt Simms, QB; 5. Matt Bosher, punter. I just wish Matt Schaub were 6 instead of 8. Simms needs to beat out Sean Renfree, the former Duke passer, for the third QB here. Carolina: Mike Scifres, punter. After 100 years in San Diego and coming off left knee surgery, Scifres hasn’t had a great camp so far. He’s battling a rookie named Swayze Waters, and Ron Rivera kept open the possibility last week he could bring in another punter for competition. So we’ll see. Tampa Bay: Bryan Anger, punter. The man drafted five picks ahead of Russell Wilson in 2012 wasn't quite the punter-savior the Jaguars thought him to be. Now he arrives to gives the Bucs a unique group of specialists, along with rookie kicker Roberto Aguayo: Has any team in recent years (or ever) had a punter and kicker who entered the league as top-70 draft picks? 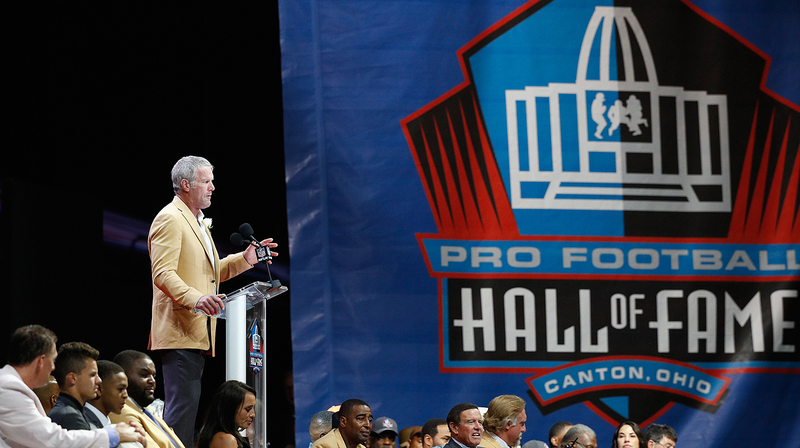 Brett Favre’s 36-minute speech was the longest in the history of the Hall of Fame. —Brett Favre, the first Hall of Famer in memory to make his speech without a script, recalling the last game of his high school career. —Randy Moss, in his first appearance on an ESPN pregame show Sunday night, when the Hall of Fame game was canceled because of poor field conditions in Canton. —Carolina GM Dave Gettleman, after watching his players go wild at a lunchtime magic show in the camp cafeteria. Gettleman wasn’t sure whether the 20 or so players having great fun in the cafeteria would translate to anything on the field, but his point was that this team is a together team, and that matters on a winning team. I saw the magic show, and wrote this story about it. "I've been in the league for nine years now, and I've only been on two teams where the guys were a team: the New York Giants and now with the Patriots." —Patriots tight end Martellus Bennett, in a cool story about the Bennett brothers by Mina Kimes in ESPN The Magazine. Weird. Martellus Bennett would have been able to meet his teammates as a group for the first time when off-season workouts began April 18. He did this interview in the summer, before training camp and before any games were played. And he can judge the Patriots’ team ethos already. Not saying he’s wrong. Just saying that is one quick and decisive indelible first impression he got from the Patriots, to make that judgment now. —San Francisco coach Chip Kelly, told the other day by a reporter that there seemed to be a lot of misconceptions about him. —New Atlanta pass-rusher Dwight Freeney, 36, who most assuredly will not be playing 45 snaps a game in 2016. Freeney played 13 games in Arizona last year, and was on the field between 21 and 33 snaps in those 13 games. Allen Robinson hopes to benefit this season after getting in extra work with his quarterback over the summer. Last year, Blake Bortles, then 23, and Allen Robinson, then 22, connected 80 times for 1,400 yards and 14 touchdowns. They were one of the impressive touchdown combinations in the NFL. What do they do for an encore? And how do they get better? Well, the ages help, first of all. They’re single, and the most important thing in each of their lives is improving at football. 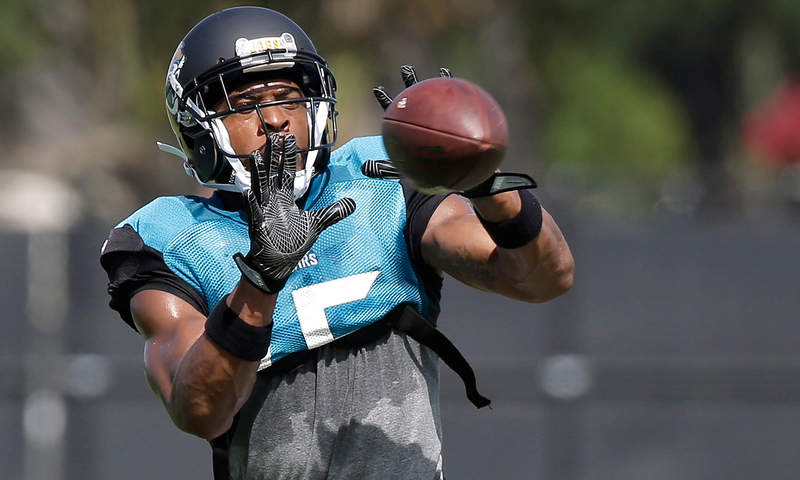 They did that by meeting about 25 times, most often with other receivers there too, in the offseason in Jacksonville, and then also nine times in OTA practices at the Jags facility. Thirty-four throwing sessions together. I asked Bortles how many throws he’d made to Robinson at each one. He estimated between 30 and 60, either on routes or with Robinson in a static position downfield, so Bortles could practice. I asked Bortles if it would be fair to take the average—45 throws to Robinson per session. He said yes. “We have a simple stick combination,’’ he said, referring to the staple of so many offenses. The stick route sends a receiver or tight end five to seven yards down field, and he and the quarterback read what the defender’s doing on the play and make their decision accordingly; usually the quarterback will throw to the shoulder away from the defender. It works so well because oftentimes, when the quarterback takes a short drops against pressure, he needs a sure-thing intermediate concept, and this is about as sure as it gets. And in practice, Bortles had been enjoying the matchup of Robinson against free-agent import cornerback Prince Amukamara. Continued Bortles: “Three receivers. The two inside run the [stick] route, and the outside guy runs a little fade in the end zone. And Allen was out wide and for the past two or three days, he had been crushing Prince on slants, just low one-step slants. But here, immediately from the snap, he gave a little one-step-in slant and took off running a fade, instead of a slant. That wasn’t necessarily what he should do, and last year he never would have done that. But he knew Prince was a little bit shell-shocked from this slant he’d been crushing him with over the last couple days. “Last year, if the call was a fade, Allen would have just run a straight, normal fade. But he’s gotten better at really understanding our offense and understanding defenses and corners. And I think now us being on the same page, to where if it was our first time together, I would have looked at him and been like, ‘Oh my god, what’s he doing?’ But now I see what he’s doing, I know what he was doing, and I adjust with him, and I throw a ball to him for a touchdown. I told you to remember the number 1,530. That’s 34 off-season workouts between the third-year quarterback and the second-year-old wide receiver with designs on being great, with, according to Bortles, about 45 throws per sessions between the two … 34 times 45 equals 1,530. Want to get better at something? Do it 1,530 times. Tampa Bay quarterback Mike Glennon and his wife had a baby last Wednesday, which was also Tom Brady’s birthday. The Glennons named their baby Brady, born 39 years after Tom Brady was born in the Bay Area. Dad says Brady Glennon was not named after Tom Brady, but it seems like a little bit too much of a coincidence that Brady was born on Brady day for Brady to not be named after Brady. There is a video beer ad in Everbank Stadium, home of the Jags, featuring owner Shad Khan holding up a new Bud Light can with a Jaguar logo on the front. Good-looking can. “We call them Khans,” the Jacksonville owner says. WE CALL THEM KHANS, the message board blares. Eagles owner Jeffrey Lurie had the ultimate wildlife vacation. He went on a gorilla trek in Rwanda. Came a few yards from a gorilla family and just observed. Eagle vacation runner-up: President Don Smolenski was in Iceland with his family the day Iceland’s soccer team beat England in the European championships. The Smolenskis were glued to the TV, as were all Icelanders not in France for the game. Some nights on the training camp tour are just cool. Last Wednesday was one of them. By day we saw the Falcons northeast of Atlanta. The next day, we were scheduled to see the Panthers in Spartanburg, S.C. So Wednesday night, we stopped by Fluor Field in Greenville, S.C., to see the Class-A Greenville Drive against the Asheville Tourists, with Drive GM Eric Jarinko our host. A beautiful night for baseball—warm but not oppressive. It would have been perfect had I not bounced the first pitch. Which was actually a football. I threw out the first football to former Fresno (Calif.) high school receiving star-turned-Drive outfielder Trent Kemp, and he short-hopped it fluidly. “No problem!” he said after the errant toss. Then we met some fans, had some beers, ate some barbecue sandwiches, talked to some more fans, put it all out on Facebook Live (yes, even the one-hop football throw), and were on to the next stop. Anyway, no great dramatic story here—just gratitude to good people for a nice evening at the ballpark. A lot of 11 p.m. calls to Dads tonight during this Brett Favre speech. What a tribute. A favorite memory of Alex Rodriguez is of us sitting in dugout at Yankee Stadium years ago, discussing how both of us highlighted our hair. Quick takeaway from #49ers camp. Matt Ryan and the Falcons have improved their win total for three straight seasons, a trend they hope to continue after last season’s 8-8 campaign. a. Washington won’t be changing its nickname anytime soon. When I was in camp, talking to club president Bruce Allen the other day, a visitor to camp approached me and said he really liked my stand on the team name, how I proposed a couple of years ago that the name should be “Americans” or “Warriors” instead of “Redskins,” and the team could honor the military at every home game. (I cannot take credit for the idea, by the way.) So I was a bit stunned that this fellow didn’t recognize Allen, who has led the drive to never, ever, ever change the name. At one point, Allen said in no uncertain terms that the name would not be changed. b. Jameis Winston is ripped. He’s lost only eight pounds (he weighs 231 now), but the change in his body is noticeable. He hired a trainer and is eating smart—and not at all hours of the day—after getting a body wakeup call seeing his peers at the Pro Bowl. 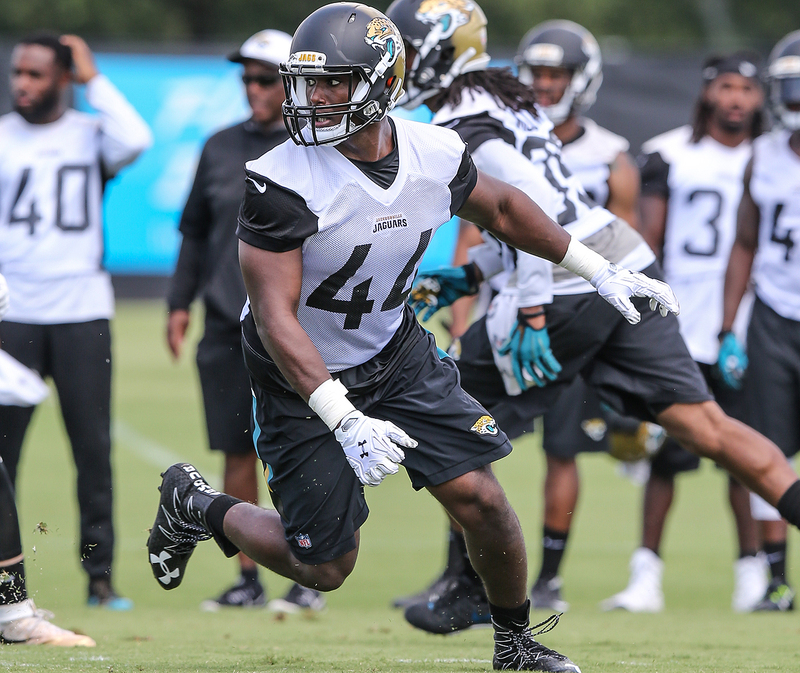 c. Watched some training-camp tape of Dante Fowler, the pass-rusher Jacksonville drafted third overall last year, then lost for the season in his first practice with a torn ACL. Actually, watched with Jags GM Dave Caldwell. Two impressive things: His lateral quickness and quickness around the edge seem unaffected by his surgery; he’s Von Miller-quick. And on one bull-rush against backup tackle Josh Wells, Fowler—giving up 54 pounds to the tackle—punch-rushed with a shot to Wells’ sternum and Wells went backpedaling fast, to keep his balance. The perception with Fowler is so focused on speed and quickness as a rusher, but it’s not just that. Tackles are going to have to respect his power. f. Three early standouts for the Patriots in camp: wideouts Aaron Dobson (who before this season had been unreliable, with just 53 catches in three seasons) and practice-squadder Chris Harper, who, according to Bill Belichick, “has probably made as much progress as any of our players in the last calendar year.” Dobson’s just more mature this year, perhaps realizing year four was his last straw in Foxboro … and guard-tackle Joe Thuney, the rookie third-round pick from North Carolina State. On our visit to Foxboro, Thuney got high grades for toughness, versatility and shutting his mouth. Watch returning offensive line coach Dante Scarnecchia get Thuney ready to play meaningful downs by Week 1. That’s what the Patriots do: get young linemen ready to play, then play seven or eight multiple series per game to see what combinations are smart. 2. I think the Pro Football Hall of Fame has this challenge on its hands, and it’s a daunting, and perhaps impossible, one: to make the weekend gauzy and warm and fuzzy and nostalgic, all in one. When baseball inducts its players, you invariably read stories headlined thusly: “Reflections on a weekend with the baseball gods.” (Dan Shaughnessy, Boston Globe, July 25.) In fairness, Shaughnessy was honored this year for long and meritorious writing on baseball. But the point is, those stories and feelings are common around the baseball Hall’s inductions. Is it the media, celebrating the history of baseball more than football? Is it the fact that so many media members who cover baseball have had such a love affair with the game for so long? Or is the fact that media folk covering football can’t find the same way to celebrate the history of the game when so many former players have long-term health problems? 4. I think this video of a Spartanburg High linebacker and a Panthers linebacker—mentee and mentor from the day the two squads practiced side by side—is one I’ll remember for a while. The kid was so honored to be with his idol. 5. I think it’s probably smart to play the Pro Football Hall of Fame Game—if you’re going to play it at all—54 miles north in Cleveland, with a pristine field, rather than on a glorified high school field at the Hall of Fame in Canton. There’s just too much at stake, even with a first preseason game with regulars barely seeing the field, to play the game on a risky field. 6. I think this is the underrated matchup of Week 1: Former Falcons coach Mike Smith and former Matt Ryan tutor Dirk Koetter—now the defensive coordinator and head coach of division rival Tampa Bay, respectively—at Atlanta, where coach Dan Quinn is very noticeably dismantling Smith’s read-and-react defense and replacing it with a voracious one. 8. I think I’m ready for the Rams edition of “Hard Knocks,” which debuts Tuesday on HBO. I have not seen any early clips—though I did ask—but I can tell you these factoids: It’s the first “Hard Knocks” featuring a West Coast team and the first time they’ve had the No. 1 overall pick from that year’s draft (Jared Goff). Look for a lot of coach Jeff Fisher and for NFL Films to try to blend in plenty of Hollywood glamour. 9. I think there are three injuries of early camp that hurt teams the most: Chicago center Hroniss Grasu (torn ACL, according to the Chicago Sun-Times), which takes Jay Cutler’s impressive young security blanket away; Detroit tight end Eric Ebron, who may have suffered an Achilles injury in a team scrimmage Saturday; and (this will cause an eyebrow or two to raise) CFL transplant wide receiver Eric Rogers, who tore his ACL in a non-contact kickoff drill the other day in 49ers camp. No one knows much about Rogers, but the Niners had plans for him and had to outbid several teams last winter to sign him. That team needs big contributors on an offense lacking them. But if Ebron is lost, that would put the top three Detroit tight ends out, at least for now, with Brandon Pettigrew (on the temporary NFL PUP list) still rehabbing from knee surgery. And without Calvin Johnson, Matthew Stafford was going to need a breakout season from Ebron, the underperforming 10th pick in the 2014 draft. If Ebron is lost, the pressure on Stafford multiplies. a. I am rooting for you, Yusra Mardini. The whole world is—or should. b. A swimmer for the Olympic Refugee Team … what a great idea. c. How cool was it Sunday evening to see David Ortiz and teammate Travis Shaw make their way to the press box to greet Vin Scully, and to thank him for his years of service to the game? I love that. d. Scully told the story during the Dodgers-Red Sox series this weekend of Ted Williams hitting a homer in his last at-bat of his career, thinking seriously of forgetting his grudge against Boston sportswriters and tipping his cap when he crossed home plate, and then not doing it. Scully quoted John Updike writing, “Gods don’t answer letters,’’ regarding Williams’ refusal to doff his cap. (Actually, it was “Gods do not answer letters,” but who’s counting?) The retelling the story was so beautiful. f. Way to go, Ichiro: You not only got your 3,000th hit in American baseball, but you got it with a triple. I feared an infield dribbler, because Ichiro had been struggling so, and residing mostly on the bench. g. I suppose I should have some strong feelings about Alex Rodriguez not playing baseball any more, after Friday. I'm ambivalent. Never liked him much, and certainly not since the positive PED tests. But all sports need villains, and rivals, and he was a good one for such a long time. h. Coffeenerdness: Shoutout to Steve Mejia and the fine service people at Fields Mercedes Benz in Jacksonville. Not only was there terrific coffee in the customer waiting room but also there was great and timely service when The MMQB’s van need three gallons of fluid for some emission protector called diesel exhaust fluid. We had about 50 minutes before Jaguars practice to fix the van, and Steve got us in and out in 20 minutes. Really saved us. And the coffee was good, too. That’s what I call good service—and he gave us a couple of gallons for the rest of trip, just in case we get low in this last week of the journey. i. Beernerdness: One overriding thought about the quality of beer on this two-week tour so far—the quality of craft beer in this country is utterly fantastic. There’s been Titletown Brewery in Green Bay; Upland in Indiana; Farmer Ted’s Cream Ale, from Asheville, N.C.; Fu ManBrew witbier (Monday Night Brewing in Atlanta); and Love Street Kolsch Style Blonde, from Karbach Brewing here in Houston … All you brewers, please take a bow. You’ve helped make this trip fun, with so many options in virtually every camp stop we make. Dinners are fun when you’ve got so many choices for a pregamer. j. I feel so much pressure now that I know Andrew Luck reads number 10 of Ten Things I Think I Think. However will I focus on the inane task at hand?! k. Tom Jackson had his last telecast on ESPN Saturday night. He deserves our respect, and our affection too. He’s a good person. Twenty-one years ago, at the Dallas-Pittsburgh Super Bowl in Arizona, I had my brother-in-law and his dad at the game with me. The night before the game, we were out to dinner at a restaurant in Scottsdale, and I saw Jackson. He said hi, and I introduced him to dad and son. He walked back to his table. Five minutes later, three drinks showed up at our table. “They’re from that guy,” the waiter said, pointing to Jackson. l. And you, Chris Mortensen: So glad to see you recognized by your peers with the McCann Award, given annually to a scribe with meritorious service covering pro football. Great to see you on hand. m. Attention fans in and around Cincinnati: The MMQB team will have a tweet up Wednesday, 6:30 p.m. at the Moerlein Lager House. We'll be there until about 8 p.m. Come join us for a beer and some Bengals talk. Did this one just get scheduled? Black eye of the week.